David Stow Adam graduated MA from the University in 1881, BD in 1884 and was awarded an honorary DD on 25 June 1912. In between degrees, Adam taught Logic and Metaphysics at the University (1881-84). He also taught Hebrew at the Free Church College in 1885-86 while serving as assistant minister at St John's Free Church. In 1886, Adam was ordained Free Church minister at Banchory-Ternan, Kincardine. In 1890 he went to Kelso, Roxburgh, and in 1895 he became minister of St Andrew's Free Church, Greenock. 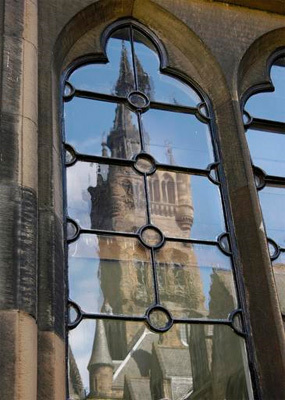 In 1907 Adam was appointed to the Chair of Systematic Theology and Church History at Ormond College, Melbourne on the strength of references from Thomas Martin Lindsay, Edward Caird and William Paterson Paterson, Professor of Divinity at Edinburgh. There he became a a pioneer of Australian ecumenism, the promotion of unity between the different denominations of Christianity, publishing several works as Cardinal Elements of the Christian Faith (London, 1911), Presbyterianism (Melbourne ), Christianity and War (Melbourne, 1915) and A Handbook of Christian Ethics (Edinburgh, 1925). During World War I, Adam served as chaplain with the Australian Imperial Force. He died on 31 January 1925 at Canton, modern day Guangzhou of typhoid fever having embarked in later 1924 on a tour of Chinese, Japanese and Korean mission stations.